Read and share our Energy Know Your Rights cards which tell you five of the most important bits of information if you’re in debt or in trouble with your energy company. Get in contact with us if you’d like us to send you some of these to hand out in your community. To download ‘Know Your Rights’ cards in English : click here. Gas and electricity bills are too high, and if this leads to debt there are no ideal solutions. However, there are ways you can stop the companies making things worse than they are already. Above all, you want to avoid getting disconnected. If you are, it will cost more to get reconnected, and you’ll be in a worse position after that. Good advice is available from many sources to help you stand up for your rights. To download the PDF click here. We were inspired to write this guide to gas and electricity rights after a growing number of calls and emails from people struggling with fuel costs, fuel debt, damp homes, unwanted prepayment meters, and useless rip-off landlords. 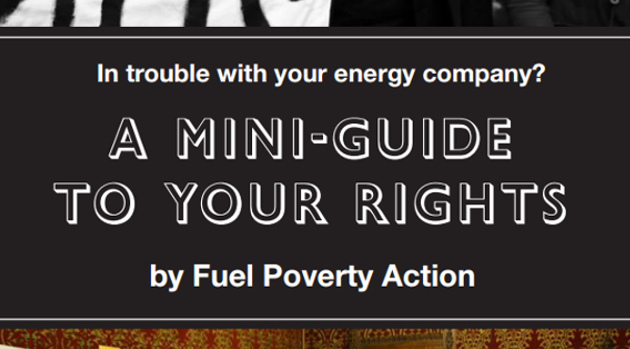 Much of the advice comes from the invaluable Fuel rights handbook (16th edition) http://www.cpag.org.uk/bookshop/fuelrights, published by Child Poverty Action Group. Readers should refer to the handbook itself for more detailed and more extensive information. Any inaccuracies in condensing the information are our own. More and more, people are refusing to accept unacceptable fuel costs. Many people are challenging the energy companies over the size of their bills, the pressure they are put under, or the settings on their prepayment meters. Often, in addition to the high prices they charge, the companies manipulate things to their own advantage, bend the law, or make mistakes in their own favour. If we all stand up to them together, we will be stronger. Make sure you share your experience through the Fuel Poverty Action website, and let others know what you’ve suffered, what you are doing about it – and whatever you manage to win! Remember — the hated Poll Tax was abolished in 1990, after thousands of people refused to pay unjust bills.